A very festive and hardy holiday ‘saison’ home-made at Belgium’s smallest family brewery. Extra rich for the holiday season, at 8% alcohol by volume. Rated 8’s and 9’s (out of 10) by the authors of The Beers of Wallonia. As the label says, really just a richer version of La Moneuse, using a little caramelized malt and maybe more hops. The malt flavor of the Special is a little darker, roastier, and certainly sweeter, which must somehow distract attention a bit from the earthiness which is so notable in La Moneuse. 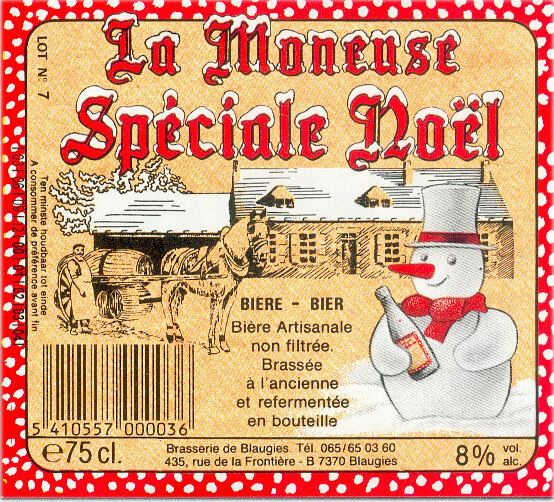 The Beers of Wallonia authors opine that the Special Winter offers more “character” than the regular La Moneuse, but we don’t entirely agree. The beers share a lot of the same characteristics, but in different proportions. Like La Moneuse, the Winter is rather fizzy. Note: La Moneuse Special Winter is notorious for lots of yeasty sediment clinging to the sides of its bottle in a somewhat un-aesthetically pleasing manner. However, have no fear, this unsightly addition to the beer only enhances the flavor. We checked with the brewery, and they insist that not only can they not get rid of it, they wouldn’t care to, as it’s what gives the beer it’s rustic and unique character.